Feb 14th 2011 turned out to be an exciting day with regards to weather phenomena and the night sky. During the afternoon GFS had predicted CAPE values of 200 with LIs of 0 across N. Ireland during the passage of a trough with very cold air aloft and although nothing exciting was expected there was a chance of Wintry showers with a risk of snow on lower ground. I checked the Met Office radar and saw a fairly large cell/shower with moderate rainfall echoes over southern N. Ireland which got my attention since it was the best thing on the radar, it was moving NE and would pass over my area within a couple of hours so I was considering a short chase to intercept the cell incase it had a nice shelf cloud on the leading edge however when I looked at the visual sky I decided to put an end to that idea as the sky was simply a slate grey mess and not camera friendly. Just when I was on the verge of giving up on the day I saw a post on facebook from chaser Paul Martin from Omagh reporting massive snow flakes which got my undivided attention. I watched the cell on radar as it advanced to the N, when it approached the Mid-Ulster area it intensified rapidly developing red radar echoes indicating high precip rates, the radar signature was evident for at least half an hour and during that period it passed directly over my home town of Maghera. The darkening sky from the SW signaled the arrival of the cell which was preceded by an uneventful period of light drizzle then suddenly it began snowing with a vengeance for an extended period of time. The snow was falling with purpose and looked typical like what one would expect during Winter, however typical soon changed to exceptional. 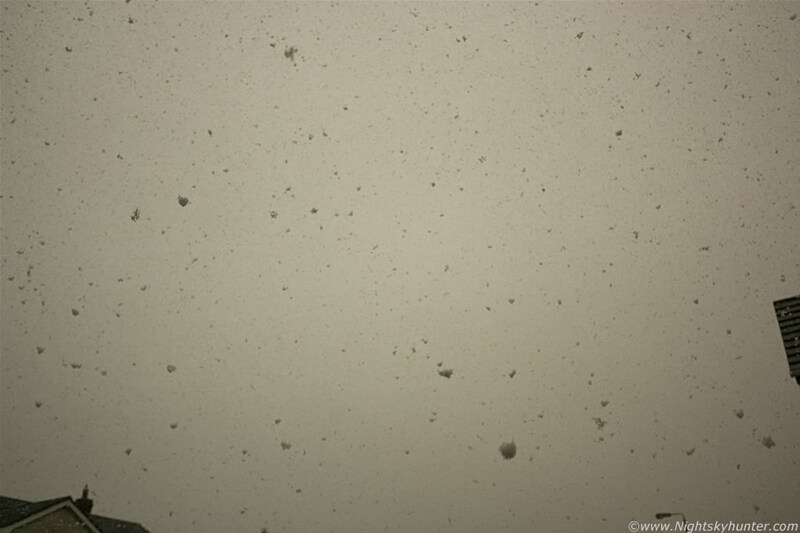 As I watched it soon became apparent that this was no ordinary snow shower because the flakes were the biggest I had ever seen in my life, I stood at my backdoor watching with amused fascination as these giant snow flakes fell at a very high rate, I really couldn't believe my eyes. The average snow flake size was similar to the dimension of a golf ball however there were regular lumps the size of tennis balls!! !, by that I mean they were equal to the length/cross section of a tennis ball in the 3" to 4" range and as they hit the ground I could hear a very audible 'splat' each time one of these 'tennis balls' slapped onto the concrete. I got confirmation text messages from Declan O'Doherty and Conor McDonald reporting the same thing, Declan said he was able to pick out one of the big flakes from high up in the sky and follow it all the way to the ground. My Mum agreed that she had never seen anything like it before in her life. Unfortunately the ground was too warm and wet so the flakes melted in an instant so there was no way of getting a close up image of the bigger flakes on the ground which made documenting the size very difficult so I had no choice but to try and get them in the air on a still image. The above image is one of many attempts to do this, this is looking up at a 30 degree angle as the snow fell from the sky, there was no wind so they fell to Earth in a vertical fashion. It's very difficult to convey a sense of size and scale on this image, however if it helps this was taken with the lens at 20mm so this is a semi wide angle shot indicating that the snow in the image is very large indeed. In fact, check out that 'tennis ball' to the lower R, that wasn't even close to the camera either!. This is far from a photogenic image so I kicked myself for not having drove out somewhere in advanced to find a better scene but at least I got a record of the event. I put together this short youtube clip showing the falling snow, once again it's difficult to appreciate the size of these flakes without scale so this video doesn't do it justice at all. During the beginning of the video you can hear me sniggering, I honestly couldn't help it as I was so amazed by the size of that snow so laughing to myself was the only way to deal with it, I simply felt a combination of awe and child-like fascination. This event took me completely by surprise and was the last thing I was expecting to happen this day so I was rather impressed to say the least, however the Valentine's day surprises were far from over!. During this same period our Sun suddenly came to life, a small group of pores formed and suddenly grew into an enormous sunspot group designated Active Region 1158 which stretched across the photosphere for 100,000km with a very unstable magnetic field which harbored energy for solar flares. No sooner had this been announced when 1158 produced several C-class flares followed by a major M6.6-class flare and R1 radio blackout which at the time was the biggest eruption of the new solar cycle. SOHO C2 and C3 images showed a faint but fast moving Coronal Mass Ejection (CME) leaving the Sun's atmosphere and soaring into space, since AR1158 was near the solar meridian the CME was heading directly towards Earth. This was a text book event which captured the attention of every spaceweather scientist, amateur astronomer and photographer across the planet because it meant that there was a significant chance of seeing the aurora borealis so everyone was on full alert. The CME was fast moving however when would it hit?, they normally take 2 to 3 days to reach Earth however this one was different so impact was possible within 12 to 24 hours at the very most. After dark I spent the evening watching the online aurora charts and posting on facebook where there was quite a build up with regular discussion on the subject and rightly so as after all the chance of seeing the aurora was high on everyone's list as they can be the most stunning phenomena in the night sky. The charts began to stir by late evening and soon geomagnetic activity was growing in intensity then the Bz component (pronounced B-Zub-See) tilted very far to the south with a value of - 20 or lower. When the Bz component tilts south the Interplanetary Magnetic Field (IMF) moves south also allowing a continuous flow of charged particles to reach Earth from the Sun while flowing in a undisturbed path, if the Bz was north or in the positive then the flow would pass above the Earth and no auroras would be seen. If this wasn't good enough the Bt (note that I said Bt and not Bz) was in the positive which indicated a strong IMF (negative values indicate a weak IMF) so I was getting very excited. I have spent 14-15 years observing the night sky, I have observed 84 aurora displays (including this one), undertaken hundreds of hours of aurora watching and experienced too many let down events than I care to mention. However if there is but one thing I have learned from my experience visually observing auroras and studying the charts its that the IMF/Bz component is single handily the most important event to be monitoring, forget about the oval and the KP because the Bz is where it's at, trust me on this. I checked what we call the 'traffic lights' chart, properly known as Solar Terrestrial Dispatch which is the only online chart that I trust because it has never let me down yet. 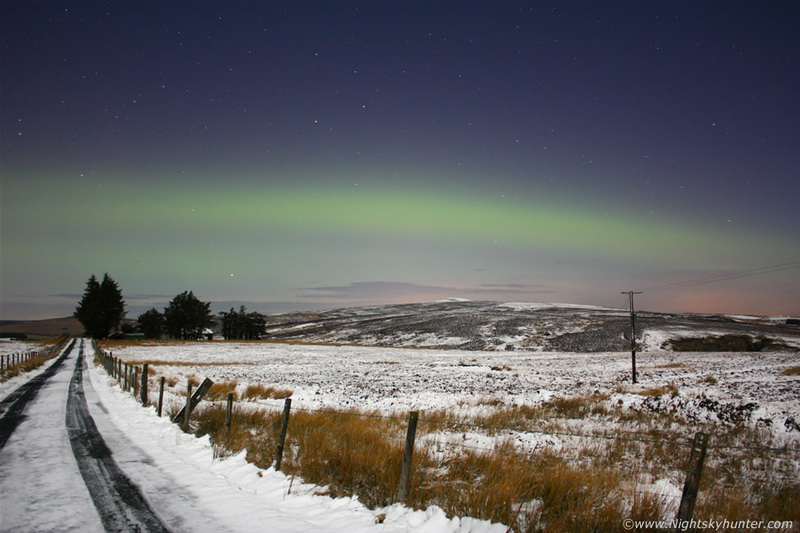 On that link you will see traffic lights for northern, middle, and lower latitudes with corresponding colour coded lights indicating the state of the aurora activity for each latitude. I have so much faith in these charts that I seldom look at others, once middle lats are flashing amber then I can be certain there is, or has been, aurora activity over northern UK/Ireland at the very least. This evening middle latitudes flashed on amber so I wasted no time and drove out to the countryside and took a test image to the N which revealed nothing, using the camera is a good method because it can detect the tell tale green signature of an aurora in an instant, even before your eyes are dark adapted. The aurora is never a static phenomena and constantly in a state of waxing and waning so I was far from disappointed so I decided to drive back home again and change into warmer clothes as it was absolutely freezing outside. Back at home I refreshed the page and saw that middle latitudes were on red alert which was something I hadn't seen for years so I rushed back outside straight away. This time I drove to the very top of the Glenshane Pass and pulled over at an old faithful location. It was truly bitter standing in this unforgiving landscape on the mountain with a harsh frost and a layer of snow on the ground which was the remains of the snow storm which passed over Maghera earlier producing the tennis ball sized snow flakes. The sky was completely clear with a bright gibbous Moon behind me which illuminated the snow to the point were it was almost like daylight. I began taking exposures and nothing was visible visually and on camera so I just kept taking images then after a few min's the aurora suddenly appeared as a green enhancement on camera, then it was visible with the naked eye and it was game on!. I sent a text alert to as many people as I could until I ran out of credit and soon the word spread and other photographers where driving out into the night to get images. I originally worded the text as a 'faint aurora' however within 10 min's the aurora brightened remarkably until I could see it easily with the naked eye despite the moonlight. 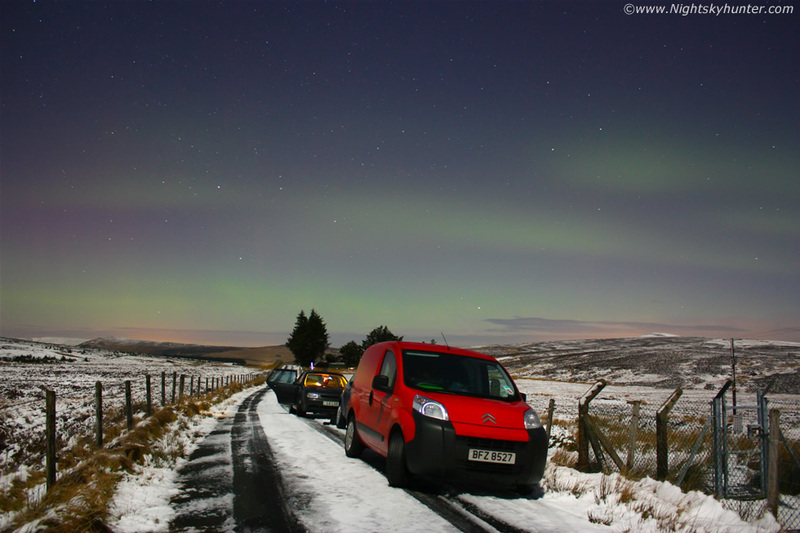 Soon Conor McDonald arrived followed by Declan O'Doherty and the three of us got to work while enjoying the aurora. The aurora was at its finest between 21.00 and 22.00 UT. I found out later that it was caused by the arrival of the CME associated with the M6.6-class flare and a solar wind stream impact. The KP was only at 4 so it was the south tilt of the Bz component/IMF which generated this display. The aurora was green in colour and stretched across the sky from N to NW reaching over 30 degrees (60 full Moon diameters) in height making this the highest I had seen since the Halloween display of 2005. I found that ISO800 between 23 and 30 sec's produced the best results using the 18mm kit lens. The camera picked up a multitude of faint vertical rays near the horizon which couldn't be seen with the naked eye, this image is looking N to NW with the stars of Cygnus, Draco, and Hercules visible from L to R, the bright star Vega can be seen embedded within the aurora above the trees L of centre. The aurora was an obvious visual sight, when Conor arrived he thought it looked like a long strip of cloud or haze high in the sky. The structure morphed from a single green band to three bands making a multi-tier light show and as we watched the bands pulsed and flickered in brightness in real time which was great to see. The three of us had a great time shooting the display and pointing out the various structure changes we observed. 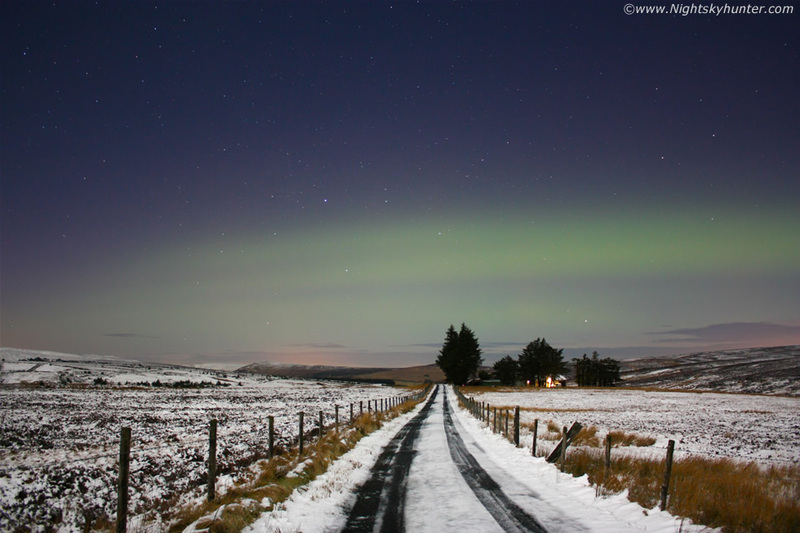 There where three car loads of us parked on this narrow mountain road, I took this image for the record, Conor and I where standing behind the camera while Declan was in the car with the open door checking the aurora charts on his laptop, it felt as cold as it looks. 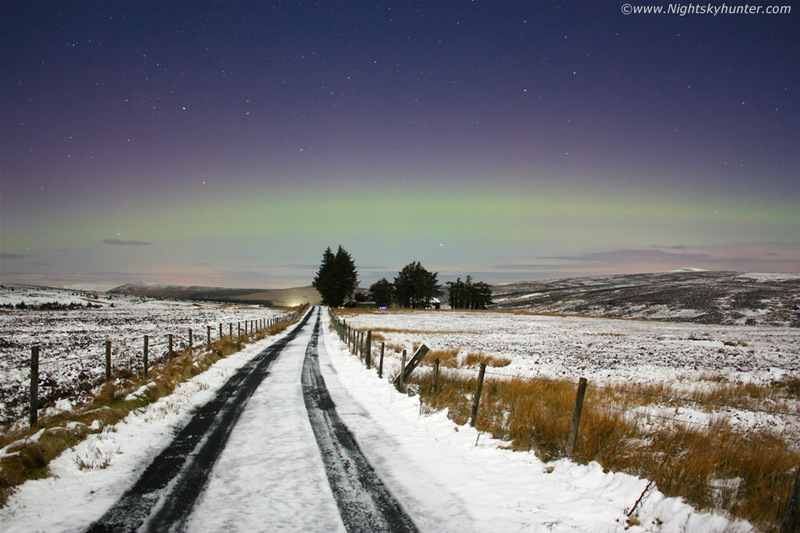 The aurora looked a wonderful sight over the moonlit snow, usually the moon is a curse for aurora observing however this was one of those rare exceptions when it actually enhanced the scene. 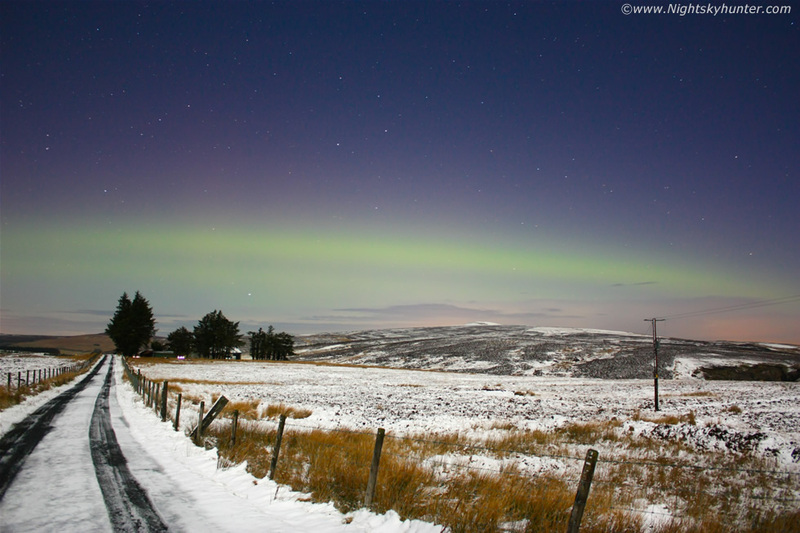 This was also the first time I got an image of an aurora with snow in the foreground at the same. This image was taken at least one hour into the display. The aurora was changing fast, it grew in height and spread out into three layers of lenticular-style green glows with clear sky between them followed by a purple glow. The green band to the NW was very active with rapid flickering and numerous rays then suddenly it would weaken only to be replaced by the N side as the new active area, then the pattern would return to the NW sector and the sequence would repeat again at unpredictable interludes. The most spectacular part was near the end when the aurora would fade from view almost completely with only a faint patch visible in the N, perhaps 10 degrees in length, then literally within one sec the aurora would be bright green and stretching across the entire N to NW sky as a single well defined band. These sec by sec changes announced the death of the display. Just hours after this aurora an X-class flare erupted, the most violent in four years, producing more mid latitude auroras over northern UK however cloud and fog hid the show for us so it was fortunate indeed that we had a clear sky to catch the Valentine's night aurora display in the act. With the sun getting more active I expect to be photographing more aurora displays in the near future while experimenting with various locations to add to the images, I can see exciting times ahead. Thanks for reading.